Father&apos;s Day is on Sunday, and families everywhere are focusing on how to celebrate Dad on his special day. If you&apos;re struggling to come up with a Father&apos;s Day gift or activity, allow me -- as a father of two -- to suggest visiting Hendricks County. I have five ideas on how to celebrate Father&apos;s Day in Hendricks County, and within each idea, I&apos;ll mention a few of my favorite options. I&apos;ll even hyperlink each option to where you can find more information about it. Sound good? Enchanted Journey, 8022 Main St., Coatesville - click here to learn more about Enchanted Journey, including a photo of some really cool pens they sell there. Finer Things, 1032 E. Main St., Brownsburg - local artwork, unique gifts, gourmet foods, furnishings, and even made-to-order gifts are available at Finer Things. Outta the Shed, 71 S. Washington St., Danville - unique home decor and other gifts that are original and affordable can be found at Outta the Shed. I&apos;m one of those fathers who really enjoys and appreciates gifts that are made by my children. The Coachman Restaurant and Lounge, 6112 Cambridge Way, Plainfield - The perfect place for the meat-and-potatoes kind of dad. Plus, the Coachman has indoor and outdoor seating, as well as frequent live entertainment. Los Patios Mexican Restaurant, 50 Old Farm Road, Danville - It&apos;s love at first bite at Los Patios if Dad enjoys Mexican cuisine. Click here to learn more. Perillo&apos;s Pizzeria, 5 S. Broadway Street, North Salem - Authentic Italian food made fresh to order by an authentic Italian chef -- and so much more than just pizza! Click here to read 10 reasons why Dad will love Perillo&apos;s.
Black Swan Brewpub, 2067 E. Hadley Road, Plainfield. Click here to learn more. Chateau Thomas Winery, 6291 Cambridge Way, Plainfield. Click here to learn more. Three Pints Brewpub, 5020 Cambridge Way, Plainfield. Click here to learn more. This is my favorite Father&apos;s Day gift of all: spending time with my kids. Since I haven&apos;t been able to find anyone who will hire my elementary school daughters for 40 hours a week, they have an exceedingly limited budget for Father&apos;s Day. So just spending time with them for little or no money at all is a great gift. Just 4 Fun Family Recreation Center, 3650 Clarks Creek Road, Plainfield. Go-karts, batting cages, mini golf, a game room...Dad will have fun here. So will everyone else in the family. McCloud Nature Park outside of North Salem and Sodalis Nature Park outside of Plainfield. 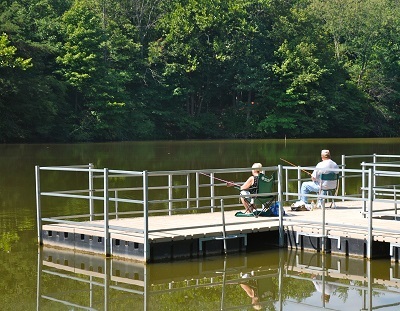 Located in opposite corners of Hendricks County, these two huge nature parks provide all sorts of fun outdoor activity to enjoy with Dad, and admission to both parks is free. Splash Island Family Water Park, 651 Vestal Road, Plainfield. Stretching out over four acres, this water park is loaded with cool, refreshing fun for the whole family without destroying the family wallet. Celebrate Father&apos;s Day in Hendricks County, and make his special day one to remember!